St. Philomena was a Greek princess who was martyred at a young age. Born into a Christian family in the 3rd century, St. Philomena found herself the desire of Emperor Diocletian, who was going to war with St. Philomena’s father. When the virgin St. Philomena, believed to be roughly 13 at the time, refused, she was subject to cruel torments like scourging, drowning and shooting. However, in each attempt on her life, St. Philomena was protected by angels who rescued her. Eventually, Emperor Diocletian had the virgin martyr decapitated. Her tomb was discovered in a catacomb the 19th century. Images on the funerary tiles on her tomb were an anchor, a palm, a javelin, arrows and a lily. In artwork, St. Philomena is often shown as a young woman, and for that reason she is the patron saint to other young women, virgins or babies. She is frequently shown with a hand to her chest, which may be representative of her wounds that were miraculously healed or simply as a gesture of the saint in prayer. She also is shown with the images from her tomb, particularly the anchor, the lily or the palm. Once a popular and widely celebrated saint, devotion to St. Philomena has faded in the years following the removal of her feast day from the Roman Calendar in 1961. And yet, her intercession continues to permeate through the world, coming to the aid of those who seek her help and protection. 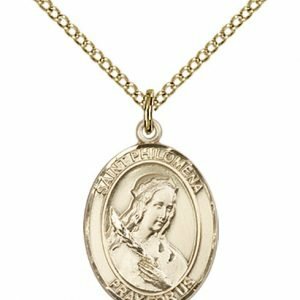 Nicknamed “the Wonder-Worker” because of the many healings and miracles attributed to her intercession, St. Philomena has been venerated by many great saints and popes throughout history, including Pope St. Pius X, St. Frances Xavier Cabrini, St. John Vianney, and St. Pio of Pietrelcina. 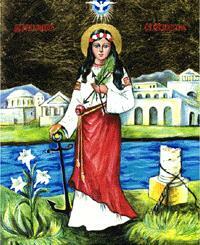 Born to pagan parents, St. Philomena’s family ruled the Greek island of Corfu. Her parents had been unable to conceive a child, and after many prayers to the gods, realized that their prayers were going unanswered because the gods they had been praying to were false and did not exist. They converted to Christianity and bore a daughter. 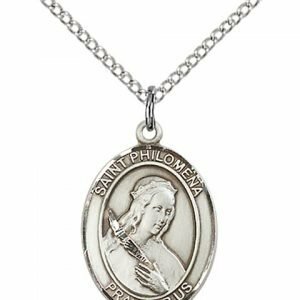 They named her Philomena, meaning “lover of light.” St. Philomena was raised in the Christian faith and developed a strong love for Christ. At the age of thirteen, St. Philomena traveled with her parents to Rome. The Roman emperor Diocletian had threatened St. Philomena’s father with a war, and he had to meet with the emperor to attempt to make peace. When her family was admitted to an audience with Emperor Diocletian, the emperor’s eyes fell upon St. Philomena at once. He was taken by her beauty and insisted that she should marry him. St. Philomena refused, though, stating that she had promised herself to God alone and would marry no man. Overcome with anger at being rejected, the emperor had St. Philomena thrown into a dungeon. Emperor Diocletian made several other attempts to entice St. Philomena to marry him – and every time she stated she would not marry him because she had consecrated herself to God alone. The emperor had her tortured severely, almost to the point of death. She was bound to a pillar and scourged mercilessly. After the torture was finished, the emperor had her brought back to the prison to die. However, she was given strength by God and continued to live. Image of an imprisoned St. Philomena. She holds a lily, symbol of her purity, and an anchor, and arrows, both used to try and kill her. 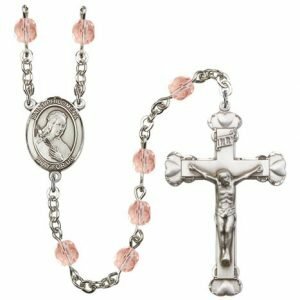 In another attempt to kill her, Emperor Diocletian had his men take St. Philomena to the river and tie a large anchor around her neck. He was sure she would not survive this attempt at drowning, and that this would terrify her into agreeing to marry him. He was wrong. 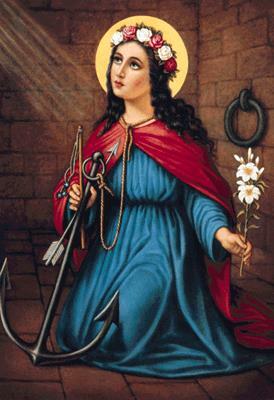 St. Philomena again rejected his offer of marriage, and so was thrown in the river to drown. Yet, she survived. Frustrated, the emperor had his men throw her in the river again. And once more, she survived. Wholly angered at his inability to convince her to marry him, as well as his inability to kill her, Emperor Diocletian ordered his men to shoot her with arrows until she was dead. However, still St. Philomena survived. The people of Rome who witnessed these events were amazed at the faith of St. Philomena in the face of peril and possible death. She was just a young girl, and yet, her faith was strong enough to carry her through the pain of the torture – and even to save her life from the many attempts at killing her! 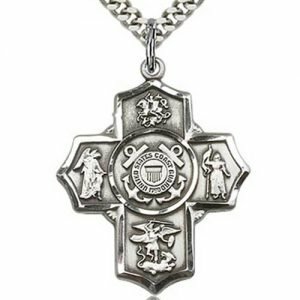 Seeing this caused many Romans to begin believing in the power of the One, True God, and they converted to Christianity because of St. Philomena’s example. Emperor Diocletian became even more enraged at finding out that the people of Rome were turning from the false gods and converting to Christianity. Determined to put a stop to his embarrassment in being unable to both convince St. Philomena to marry him and to kill her for rejecting him, Emperor Diocletian ordered that St. Philomena should be beheaded. St. Philomena was martyred for her faith and singular devotion to Christ in 304. The tomb of St. Philomena was inscribed with the words “Peace be to you, Philomena,” as well as the symbols of 2 anchors, 3 arrows, and a palm. These symbols were a sign to other Christians that she was a virgin and martyr. However, her story was lost to history until an archaeological dig in the early 19th century in the catacombs of Priscilla in Rome led to the discovery of her tomb. Encased in terra cotta slabs, the archaeologists knew that the person who had been buried there was of particular importance, for this type of burial was reserved for nobility and great martyrs. When her tomb was opened, the archaeologists discovered the body of a fourteen year old girl, as well as a vial of her blood. On August 10, 1805, her remains were transferred to Mugnano, a town near Naples, in Italy. This is where they rest today. During the transfer process, though, miraculous events began to take place. Some of these included the healing of a woman’s blind son, a cancerous growth disappearing from a woman’s hand, and a woman with a life-threatening heart condition suddenly regaining her health. Seemingly overnight, the world began to hear of the miracles attributed to the intercession of St. Philomena and her popularity grew. Pope Leo XII, calling her the “Great Saint” granted permission for altars and chapels to be built in honor of St. Philomena. Later, Pope Gregory XVI authorized the public veneration of St. Philomena after approving the veracity of a miracle attributed to her intercession. 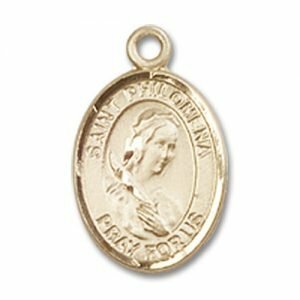 Pope St. Pius X had great devotion to St. Philomena, and encouraged an increase in devotion throughout the Church to this great saint. 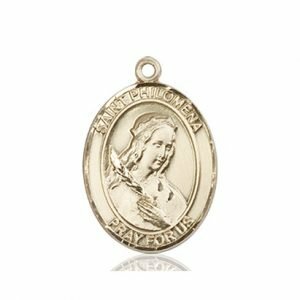 Many saints and other members of the faithful were also known for their love for St. Philomena and their belief in her ability to intercede for them in their times of need. However, in 1961, a decree was issued by Rome stating that due to a lack of historical evidence to support the traditional story of St. Philomena’s life, her feast day was to be removed from the Roman Calendar. In doing so, many Catholics mistakenly took this to mean that St. Philomena was somehow no longer a saint, and devotion to her faded. However, this was not the case. The removal of her feast day was only to signify that the Church takes matters of canonization and devotion seriously, and without the required documentation and proof, they would no longer celebrate her with a formal feast day marked in the calendar of the Church. This action did not state that St. Philomena’s existence or sanctity were in question, nor did it discourage devotion to her. 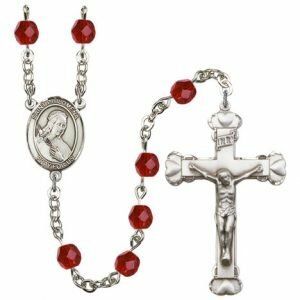 In fact, seeking her intercession is regaining popularity among Catholics who are rediscovering the wondrous miracles and works attributed to St. Philomena today. As more and more miracles are discovered, written about, and publicized, Catholics of today are joining with those of the past in honoring and venerating this brave young woman who sacrificed her life out of love for Jesus Christ. St. Philomena is the patron saint of a wide variety of people and causes. Among these are: babies and children, those trying to conceive, desperate or forgotten causes, prisoners, virgins, and youth. St. Philomena is depicted in art as a young woman wearing the customary robes of the early 4th century. On her head is usually a crown of flowers. 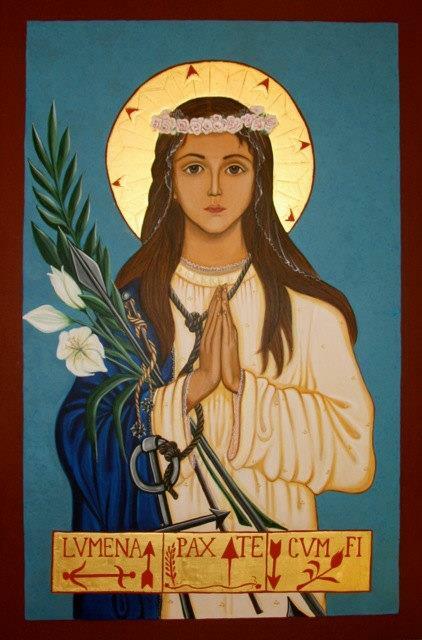 She may be holding lilies (to symbolize her purity), or be pictured with arrows or an anchor (symbols of her martyrdom, as both of these methods were attempted to kill her). 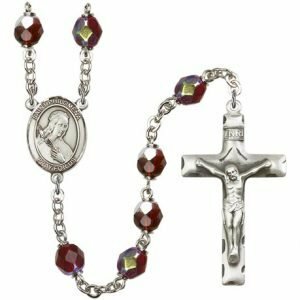 Let Saint Philomena be your partner in prayer as you say one of the prayers below or as part of your rosary devotion. Find Saint Philomena Rosary Beads here. O most pure Virgin, glorious Martyr, Saint Philomena, whom God in His eternal power has revealed to the world in these unhappy days in order to revive the faith, sustain the hope and enkindle the charity of Christian souls, behold me prostrate at thy feet. Deign, O Virgin, full of goodness and kindness, to receive my humble prayers and to obtain for me that purity for which thou didst sacrifice the most alluring pleasures of the world, that strength of soul which made thee resist the most terrible attacks and that ardent love for our Lord Jesus Christ, which the most frightful torments could not extinguish in thee. 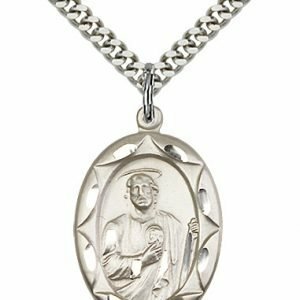 So, that wearing thy holy cord and imitating thee in this life, I may one day be crowned with thee in heaven. Amen. O great Saint Philomena, glorious Virgin and Martyr, wonder-worker of our age, I return most fervent thanks to God for the miraculous gifts bestowed on thee, and beseech thee to impart to me a share in the graces and blessings of which thou hast been the channel to so many souls. 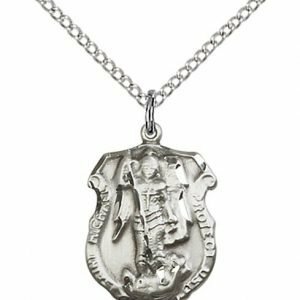 Through the heroic fortitude with which thou didst confront the fury of tyrants and brave the frowns of the mighty rather than swerve from thy allegiance to the King of Heaven, obtain for me purity of body and soul, purity of heart and desire, purity of thought and affection. Through thy patience under multiplied sufferings, obtain for me a submissive acceptance of all the afflictions it may please God to send me and as thou didst miraculously escape unhurt from the waters of the Tiber, into which thou wert cast by order of thy persecutor, so may I pass through the waters of tribulation without detriment to my soul. In addition to these favours, obtain for me, O faithful spouse of Jesus, the particular intention I earnestly recommend to thee at this moment. O pure Virgin and holy Martyr, deign to cast a look of pity from Heaven on thy devoted servant, comfort me in affliction, assist me in danger, above all come to my aid in the hour of death. Watch over the interests of the Church of God, pray for its exaltation and prosperity, the extension of the faith, for the Sovereign Pontiff, for the clergy, for the perseverance of the just, the conversion of sinners, and the relief of the souls in purgatory, especially those dear to me. O great Saint, whose triumph we celebrate on earth, intercede for me, that I may one day behold the crown of glory bestowed on thee in Heaven, and eternally bless Him who so liberally rewards for all eternity the sufferings endured for His love during this short life. Amen. Humbly kneeling before thy throne, O great and glorious Virgin, St. Philomena, I beseech thee to look favorably on the petitions I present to thee. My Patroness, St. Philomena, pray for me! Courageous Martyr, well do I know that my grievous sins deserve God’s severe punishment. Good St. Philomena, beseech God to pardon me all my sins and to teach me the ways of His holy love. Illustrious Saint, be loved child of Jesus and Mary, pray for me and help me! Gracious Saint, look graciously upon this house and bless the members of our family who devoutly honor thee. Wipe away our tears and smile benignly upon us, imparting the blessings of peace, hope, love, and good health to all of us. 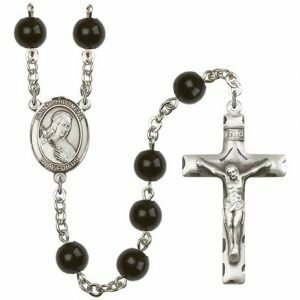 O Wonder-working Saint, pray for us and help us! All-powerful Saint, hear and help me! St. Philomena, health of the sick and the weak. St Philomena, who reigns in Glory. R.) That we may be made worthy of the promises of Christ. Let us pray: We implore Thee, O Lord, by the intercession of Saint Philomena, Virgin and Martyr, who was ever most pleasing to Thy eyes by reason of her eminent purity and the practice of all the virtues, pardon us our sins and grant us all the graces we need (and name any special grace you may require). Amen.